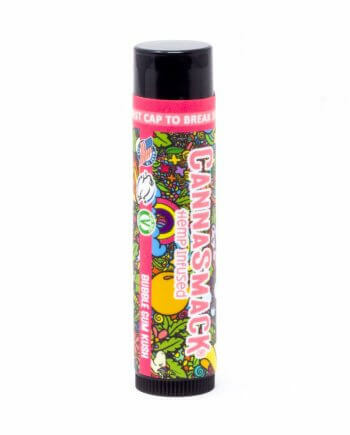 Twist the cap and there’s no going back; anyone within sniffing distance will be drooling over the sweet nostalgic aroma of Cannasmack Bubblegum Kush, a lusciously silky vegan shimmer lip balm. 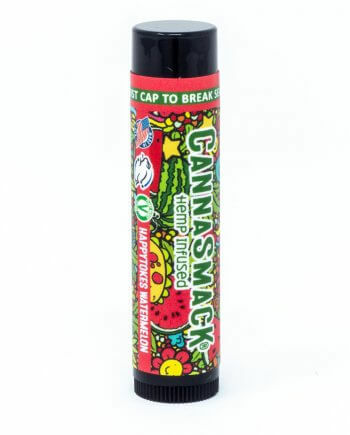 Infused with premium hemp seed oil, paired with a formula of all natural ingredients, CannaSmack offers a kiss of reliable hydration with vitamins A, B, D, E and Omega 3&6 fatty acids. 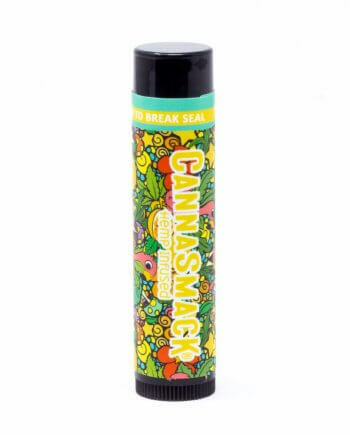 Your new favorite clear shimmer lip balm is decorated with a pattern that pops; featuring imagery of unicorns, rainbows, flowers, mushrooms, balloons, and of course: hemp leaves. I didn’t know a clear lip balm could make such a STATEMENT! The scent is crazy strong, the mica makes your lips soooo shimmery, and the balm itself is so smooth and buttery! The only reason I didn’t make this five stars is because I’m not a huge fan of the mica. I kinda wish there was a bubblegum flavor without shimmer but it’s still a great balm! I got this as a gift at the CHAMPS trade show and I LOVE IT!!!! The shimmer is a nice statement. The smell is relaxing and reminds me of my childhood. It’s soft, moisturizing and has a mild flavor. Best part is, it’s not sticky. I’m sold. This whole product line is amazing. Thank you! My only issue is the mica. It’s really more glittery than shimmery, and to me that’s a big difference. Shimmer means more of an all-over “sheen”, while this balm has lots of individually shiny “specks”. For kids, or just someone who likes glitter, that would be great! It’s just not me/not what I expected, and now I’ll have to order a different flavor. BUT the fact that I still want to order another should tell you how much I like this one despite the glitter! 🙂 overall, a great product. Was gifted this lovely chapstick by Madison when she came to 4/20 in Colorado this year. I was so surprised to like it because I have NEVER been a fan of bubblegum flavor, but I loved this! I also loved the sparkles that are in it as well, such a beautiful addition.